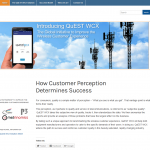 QuEST WCX is the first all-subjective quality measure and benchmark in the telecom industry. It is run under the sandbox architecture of QuEST Forum, and is based on the data collection and analysis capabilities of P3-group and Metrinomics. Through the use of a mobile application, QuEST WCX tracks technical quality and “subjective quality” at various moments throughout the day. It is filtered through an anonymous data repository before yielding a final report. This ensures the provision of a comprehensive benchmark that covers all relevant business areas within the national borders. The strict subscriber perspective simplifies the view on the customer journey. Ten items explain business to an extent of above 80%. This provides an important reference in judging on technical priorities from a business success point of view. The data package shows how the ‘business mechanics’ work for each operator. Like this, a performance can be compared on a high level, but can be broken down into specific business models, as each operator approaches the market with a specific strategy. It also compares ‘effective’ business models, the ‘business mechanics’, how in reality key items of subscriber experience move a business to the success it finds in the market. As such, it provides a transparency that helps to plan success and market strategies. You want to have a reference for BigData? Here it is! Go to your main personas and let your individualization policies start there, to keep it simple and transparent.